Photo courtesy of Divieto Ristorante. Photo by Daniele E. Jaeger. A step through the doors of Divieto Ristorante is like taking a step back in time, but with a modern twist. The newest addition to the dining scene at Coconut Point Mall, Divieto means prohibition in Italian, and that is indeed the vibe here. 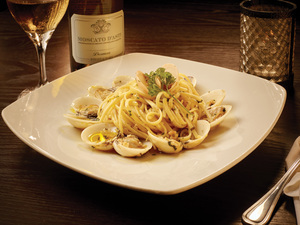 The restaurant’s concept pays homage to the great migration of Italians to the U.S. in the late 1800s and early 1900s. Dressed in 1920s-style garb, the well-manicured staff provides attentive service throughout the large space that feels both casual and like you’re someplace special at the same time. The restaurant even offers entertainment that includes live crooning of classic songs and Italian favorites. 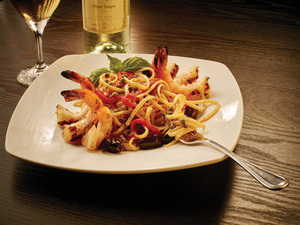 The menu is full of Italian specialties with a touch of local fare for good measure. 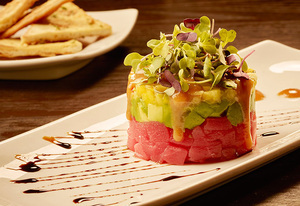 Take, for example, the tropical tuna tartar or the refreshing jicama taco. For the taco, the root vegetable is thinly shaved, then filled with a mix of surimi, mayo and serrano pepper. The menu has 70-plus items, including more than a dozen pastas that can be prepared with either wheat or gluten-free noodles. He cites the preparation for the restaurant’s signature Ruota di Parmigiano as an example. A giant wheel of aged Parmigiano Reggiano is rolled tableside, where traditional fettucine alfredo pasta is ceremoniously poured into the hollowed center. The hot pasta melts the outer layer of the cheese, seductively pulling it into the sauce for an extra-decadent treat. Whatever you do, don’t leave the extra bits of cheese behind; have them scraped on top of your pasta or put in a side bowl. The pizza served here is thin crust, with several special combinations such as fresh pear, Gorgonzola, balsamic onions, candied walnuts and fresh arugula; or mozzarella, mascarpone and Parmesan with sautéed mushrooms, ham and a drizzle of white truffle oil. The slow-braised pork shank ossobuco is towering and hearty, served over a rich, creamy risotto. The carpaccio is perfectly shaved and more than enough to share, with mushrooms, arugula, Parmesan and a truffle drizzle. Open for lunch and dinner, Divieto has a lot of space to accommodate a lot of preferences, including a private VIP room for larger parties and special celebrations. The main dining room is spacious but still cozy; many seats have a clear view of the open kitchen. The indoor terrace offers a quieter and more intimate atmosphere, while the outdoor terrace is perfect for people watching in-between courses. The bar is expansive and a great place to make new friends. Here you’ll find well-prepared cocktails and a wine list that covers more than just Italy. 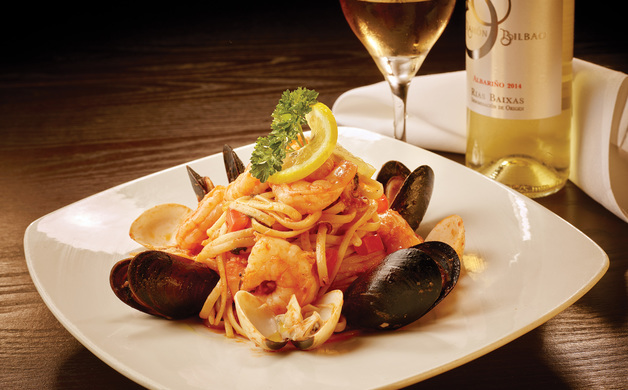 This Italian restaurant, with its class and cuisine, is a welcome addition to the dining scene at Coconut Point. Written by Gina Birch, a regular contributor, a lover of good food, fine wine, and fun times. She’s also a well-known media personality in Southwest Florida.